Calling all almond lovers - this one's for us! Ever since I had that atypical craving for cinnamon rolls early last year and made some from scratch, I've been hooked! I've made those chocolate and orange cinnamon rolls several times and now, I have some amazing almond buns (or call them "almond rolls" or "almond cinnamon rolls") to share with you! I've now discovered yet another great use for almond paste, and I'm so excited because I'll jump on any excuse to eat more almond paste and almond-based pastries! 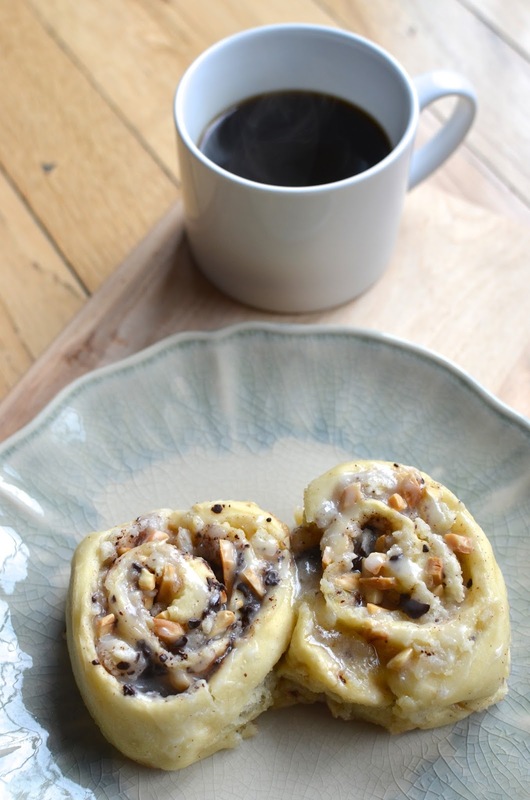 The idea for these almond buns came from Sweet Paul's Eat and Make. In the book, he has a recipe for almond buns that featured grated marzipan and slivered almonds as part of the filling. That got my attention! I took that amazing-sounding idea and adapted it to suit me. I used the small batch cinnamon roll recipe I've been using, which makes 4 beautifully soft and pillowy rolls, and instead of marzipan, I used almond paste. Marzipan is sweeter than almond paste. I've never used marzipan for baking, and knowing what I do about almond paste (it is sweet enough for me), I was pretty confident it would work just as well - if not better - for this purpose. I was intrigued at the idea of how the almond paste (or marzipan if you go that route) would melt into the dough while baking to create this gooey almond filling for the buns. After eating it, I can tell you it is divine! I also added a bit of chocolate. Honestly, I showed restraint here. I added a mere 1/2 ounce of dark chocolate in total to these 4 rolls. I wanted the look and taste of some chocolate without overpowering the almond flavor. And almond is most definitely the headliner here. To amp up the almond flavor even more, there are crunchy almonds in the form of toasted slivered almonds in the filling. Other than that, I have a little bit of butter, sugar, and a touch of cinnamon to pull it all together. It's hard to describe properly in words but...fresh from the oven, it's basically biting into a warm pillowy mound of gooey almond bun. It's literally oozing with almond flavor and especially tasty with a drizzle or two of the super simple almond glaze I made for them. I tasted the buns without a glaze and they are good even without it because there's enough sweetness and moisture from the almond filling. But in the end, I'm glad I whipped up a quick glaze. I simply whisked some powdered sugar together with milk (or use almond milk if you have it) and a few drops of almond extract - heavenly! I think I'll stick with the glaze going forward because it just makes for a more tactile, more memorable experience. And if you're going to have a sweet bun or roll like this, you might as well go all out and fully immerse yourself in it! For my small-batch recipe that makes 4 almond buns/rolls, I used 3 ounces of almond paste. I freeze the almond paste for about half an hour (to make it a little easier to grate) and then grate it finely using a box grater. The grated almond paste looks like a fluffy mound of mashed potatoes and you want it in fine pieces because it helps with even distribution and allows the paste to melt while baking in a short amount of time. All in, it looks like quite a lot of filling to lay on top of the dough, but it works. So the finely grated almond paste essentially breaks down, softens, "melts" during baking and becomes the centerpiece - making a gloriously melty, almond filling for your buns. The crunch from the toasted almonds, a bit of dark chocolate and taste of cinnamon spice in the background makes for a very delicious mouthful, in my opinion! I prep these buns the night before to have them fresh for breakfast (you just gotta eat them fresh from the oven if you're going to the trouble of making them!). They need a final rise in the morning that takes about an hour, before baking. They are done in under 15 minutes and as you can see from the baked buns above, they don't brown very much after baking. If you forego a glaze, you could brush a little egg wash over them before baking so they brown a bit more for visual appeal. I snuck one of the buns onto my plate to try sans glaze but ended up drizzling (more and more) glaze on mine as I went along. I usually prefer savory for breakfast with a few exceptions; this is one of them! Lightly oil a medium size mixing bowl and butter a 6-inch cake pan; set aside. In a small bowl or measuring cup, lightly stir yeast into the warm water. Add a pinch of sugar, cover, and set aside until foamy, about 10-15 minutes. If the mixture does not foam after that time, you will need to start over. In another small bowl, stir the warm melted butter together with the sugar until sugar dissolves, about 1 minute. Mix in milk and set aside. In a large mixing bowl, combine the flour and salt. Make a well in the center and add both the yeast and butter mixtures. Stir with a wood spoon until dough comes together, then remove from the bowl and knead with your hands for 4-5 minutes. Transfer the kneaded dough to the prepared mixing bowl, cover with plastic wrap, and place in a warm spot until doubled, about 45 minutes (or more). Turn the dough onto a lightly floured surface and roll or pat/press the dough into a 5x10 inch rectangle (I rolled the soft, pliable dough out between parchment paper and plastic wrap). Spread the softened butter over the dough, top with grated almond paste, sugar, almonds, dark chocolate, and cinnamon. Starting at the short end, tightly roll the dough, trim off the ends, and slice into 4 even pieces. Place rolls into the prepared cake pan and place in a warm spot to rise again until doubled in size, about 30-60 minutes (60 minutes being optimal). [Do ahead: Once the rolls have been sliced and placed in the pan, cover and refrigerate overnight. In the morning, remove the pan from the refrigerator, set it in a warm place to rise again - this may take a bit more than an hour - and bake.] Bake in a 375 degree oven for 12-14 minutes. The rolls will look fairly pale even after baking - for a more golden color, you can lightly brush the tops with egg wash before baking. Let rolls cool for 10 minutes in the pan. In the meantime, whisk 1 tablespoon of milk and the almond extract into the confectioners' sugar. Add additional milk (or confectioners' sugar), as needed, to reach a thick yet spreadable consistency. Drizzle the glaze over the rolls and serve immediately, while it's still warm. I am not a fan of almond, but your buns look delicious! I love the idea of baking in small batch as well. We can't always eat a dozen every time, right? Well, we all like different things and that's what makes the world turn. You could totally use another filling like I usually do with the chocolate and orange zest. I'm glad you still think they look tasty despite not being a fan of almonds. : ) A small batch of 4 is great for my family. You have to eat cinnamon rolls fresh and warm! I love that you made almond buns, the almond paste in the filling sounds incredible! I can just imagine how amazing these tasted fresh out of the oven! A small batch is perfect too because I would be so tempted to eat the entire batch in one sitting! Seriously - so yummy! Your almond buns look sensational, Monica! And a small batch is a perfect size for a big temptation like this. Oh heck, I could have polished off that small batch of almond buns in one sitting! Love the addition of crunchy nuts and chocolate. I sure wish I was enjoying a batch with my morning tea. Wishing you a super day! Oh thanks! These rolls are so soft, it's hard to take them out without smooshing them! Totally love those beauties...lots of almonds..exactly what I love. Thanks, Angie. Have a great weekend! I am definitely a big fan of them myself! Glad you like it. WOW! I am definitely going to try these - I want one right now!! Yay - so happy you like them, too, Marie! They are so good!! I got so excited when I read the title of this post! I love almond flavored anything. Love that this recipe makes a small batch. The last cinnamon roll recipe I tried could have fed an army! I love everything about these almond rolls! LOVE!!! Yay for the big love! Thanks, Amanda! You call it humble but I call it being honest! : ) But Wendy...in all seriousness, thank you so much for such incredibly kind words and high praise. I'm so happy to think that you enjoy some of my ramblings. Thank *you* for reading and being an inspiration to me as well. The almond paste worked so nicely; I'm really happy at the discovery. Good luck with your contest. I love chocolate above most things but I have to admit I rarely enter contests - I know own limits and frankly, I'm just not very creative! I love your suggestions, Lorraine! Thanks - I think other nuts would be awesome, too. Oh you did it again! I have been thinking about cinnamon rolls but was looking for a way to incorporate almond paste - I swear! These look wonderful - you hit a home run in my book. The dough looks so soft - I bet they are tasty - good thing you didn't make a big pan! Oh hell yes! Pretty similar to my first home-baked dessert in months, I didn't have any almond paste, though, or we would have been near twinsies! If I had these for breakfast, I could never have my regular ol' oatmeal ever again. Also love the idea of a bit of almond in the glaze! I love oatmeal...oddly enough, I eat it often at dinner (with other things). I generally prefer savory for breakfast but this has become one of those exceptions...I am glad it's not something you can whip up in minutes or I'd be in trouble. : ) Glad you like the bit of almond in the glaze! OMG Monica! I want these. What an amazing recipe you have come up with! Those 4 servings will be too less for my family as they will never make it outside my kitchen. This is a treat for almond lovers indeed. Mr. Eats would marry me all over again if I made these for him - They might just be his Valentine's Day breakfast treat this year! I love that the recipe is only for four so we don't feel as bad when we finish off the the whole pan! love your version of this from the Sweet Paul recipe! I actually tried this recipe when it came out...and sorta failed: things got SUUUUPER sweet and it seemed like overkill. I love your substitution here: almond paste is certainly sweet, but i imagine the end result is much more balanced than with the marzipan. totally re-trying this! That is so good to know, Shannon! Thank you. I got really lucky...these worked out beautifully and we loved it at my house. I'll be making them again soon and hopefully, often. Oh my gosh I love it! The small batch, the almond paste...I need these! I am currently in the grip of a MAJOR almond paste obsession so these are perfect for me! I might try swapping in a gluten-free flour mix and see how it goes....but I'm sure they'll be delicious either way! Wow! Almond buns with marzipan and slivered almond filling? Delish! I'm totally making this the next time I get a chance. I bet the crunch of almond would be super satisfying as well (: Wonderful recipe, Monica!